As soon as we finished filming scenes for our animated film, Liberty and Justice and handed it over to the musicians, I resumed work on my children’s book. It feels strange and wonderful to be engaged with only one project and a non-political one at that! But, it’s also like snuggling into bed and pulling up the covers, knowing that they’ll be yanked off come summer, when the movie is out. I’m illustrating My Bed, a story written by Rebecca Bond, which is a tour around the world that focuses on where children sleep. It will be published by Houghton Mifflin Harcourt in 2020. Here are links to posts about other illustrations for the book: South America, Japan, North Africa, North America, Holland, India, Iran and Russia. To see a list of all my books, click here. This scene, set in Afghanistan, has a pair of children sleeping on a family made rug, which features prominently in the verse. 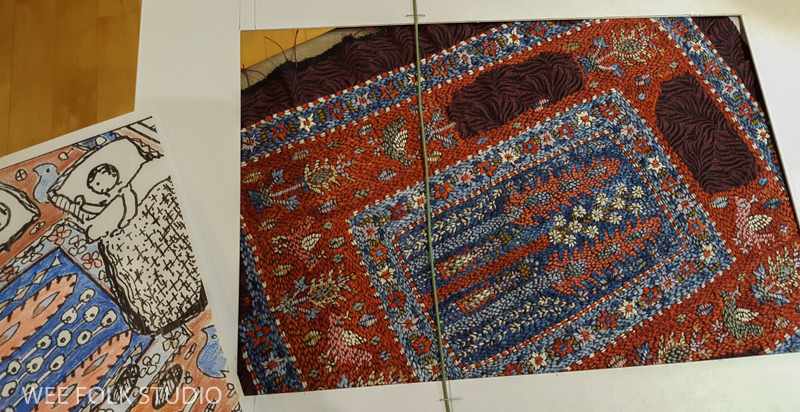 While researching carpets from the region, a photo of one with birds and trees caught my eye, so I adapted it to fit on the page. I don’t usually use color in my layouts, but in this case, I filled in the sketch with red and blue pencils to see what it looked like. Luckily, My son Ian had given me a gift of yarn he dyed for a class project – blue indigo and red rose madder. Along with the indigo and rose madder dyed yarn, I added other colors of tapestry wool. 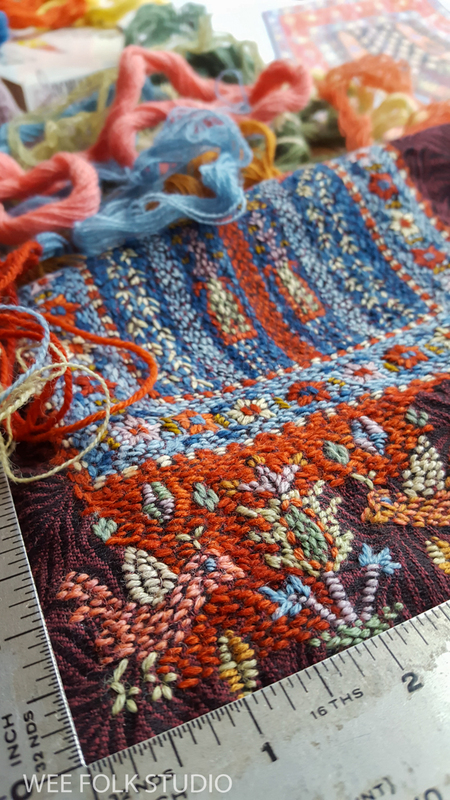 I chose a piece of dark upholstery fabric for the background, figuring that little bits of fabric would be visible around the stitches and a dark color would show off the colors better than a light fabric. 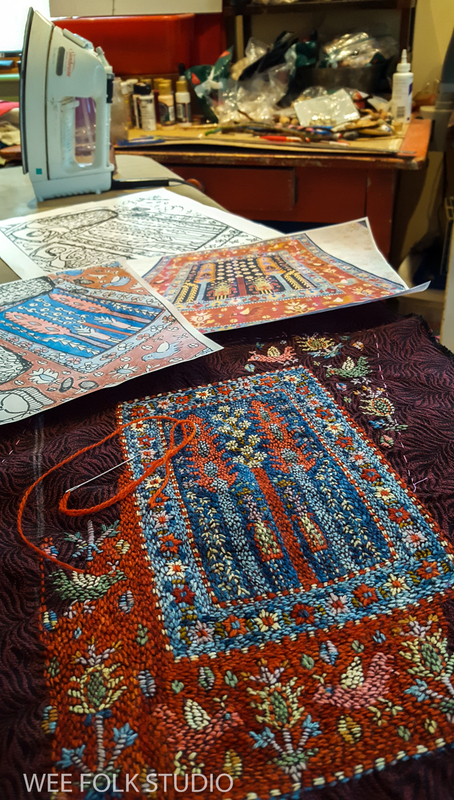 The black and dark red pattern would add a richness and I could draw the rug’s patterns with white chalk, which would fade away with handling. I honestly don’t know what one would call this kind of embroidery. 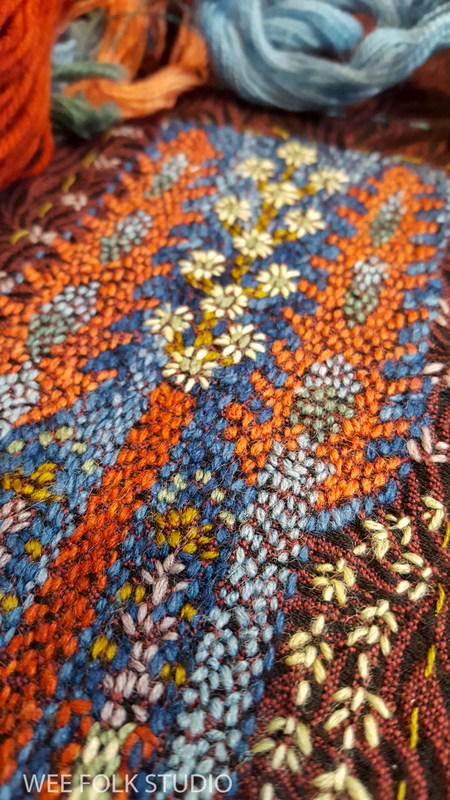 It’s just a lot of seed stitches crammed together, making a stipple effect. I wanted to give the impression of a woven rug, without actually using a grid format. Perfectly straight lines would look odd when everything else in the book is a bit wobbly. This was the perfect project to work on in winter, staying warm in front of the wood stove. As you can see, I don’t use an embroidery hoop. I usually work with fabric pieces that are too small or thick (like felt) to fit in a hoop, so I don’t even think about using one. I also prefer working with a pliable piece instead of a taught drum. 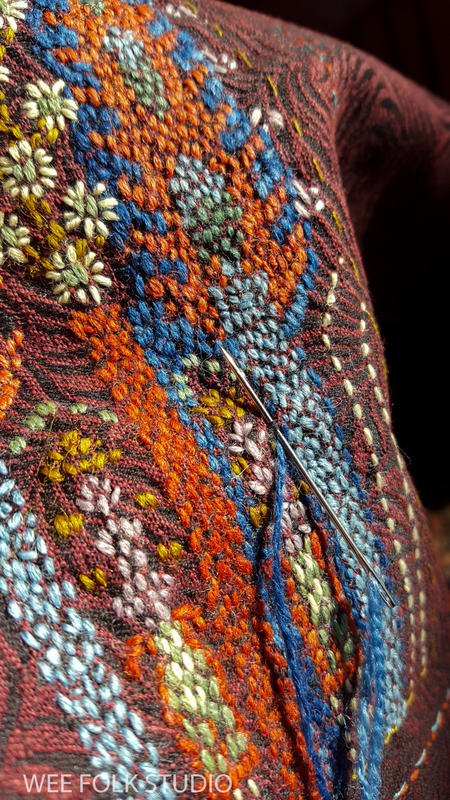 That way you can make the needle go in and out in one stitch, instead of separate down and up moves. 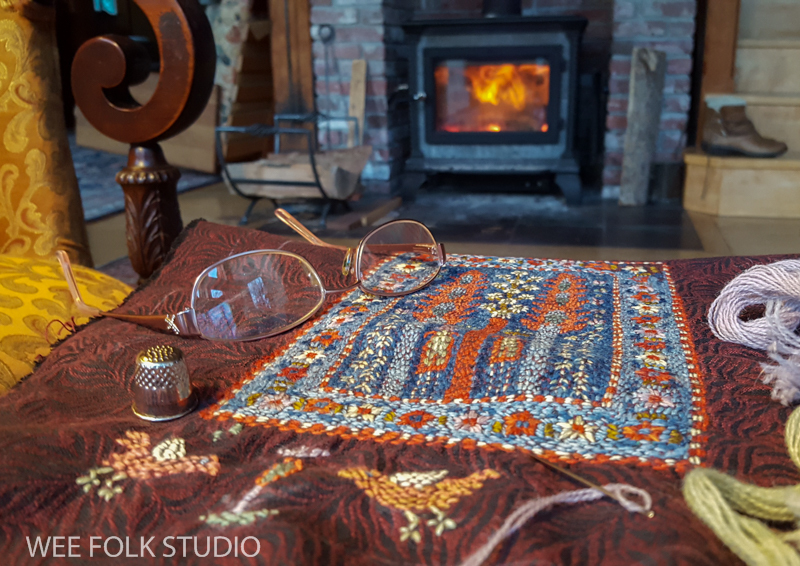 It’s hard to estimate how long it took to stitch the rug, because I worked on it off and on for a month or so, between filming sessions, in waiting rooms and sitting in the passenger seat while traveling. It was closest to filling in a coloring book that I’ve experienced since childhood, but there were times when I couldn’t just follow the pattern and had to adjust the design to fit into the page dimensions. 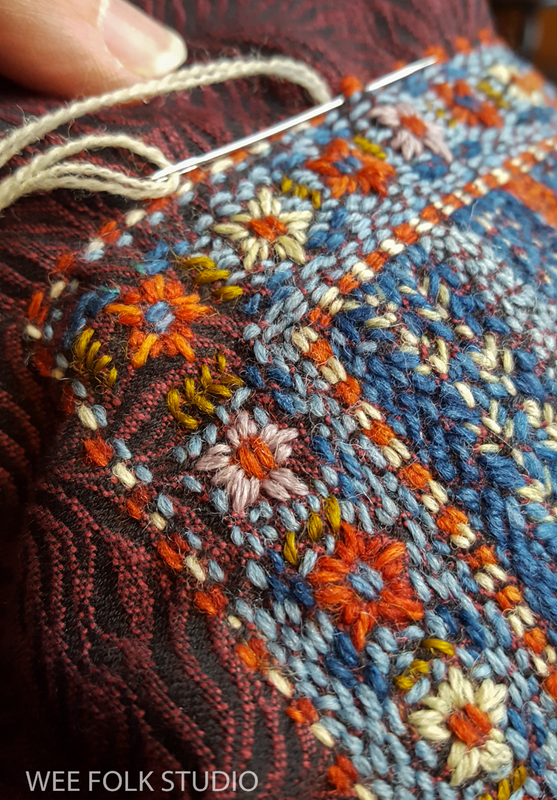 I love how the unevenly dyed yarn gives a variegated appearance, like you see in authentic rugs. 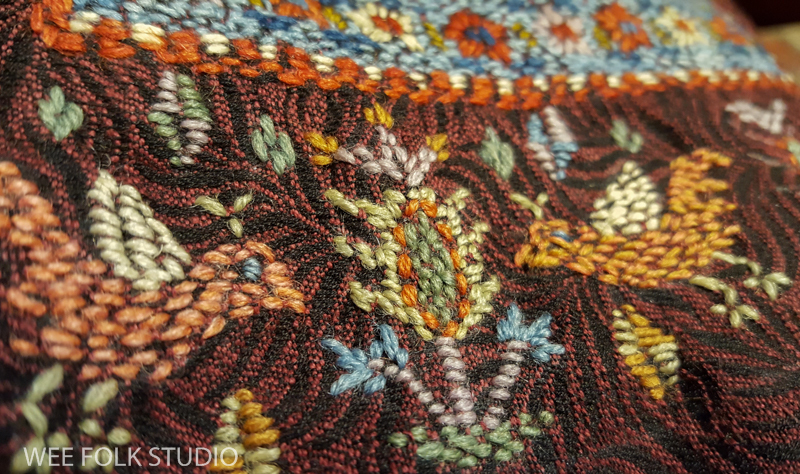 The best part is the texture of the closely stitched surface, which feels like a real woven carpet. The process of making it was soothing and calming, for sure. It’s important to keep in mind that this rug is part of an illustration that will have characters and bedding on top of it. Yes, it can be valued alone, as a textile, but that’s not sufficient enough for me. My hunger for a narrative compels me to add other elements. I liken it to the difference between a garment draped on a hanger and that same piece of clothing worn on a person who is alive in the world. Here, you can see the 3/4 page layout inside the frame. The vertical green wire indicates where the gutter, or page fold will be located. And the two blank areas are sleeping spots for the children, who will be the subject of Part 2. This is exquisite! Your talent is beyond words. I’m so looking forward to The Bed Book. Love hearing your thought processes when creating books. 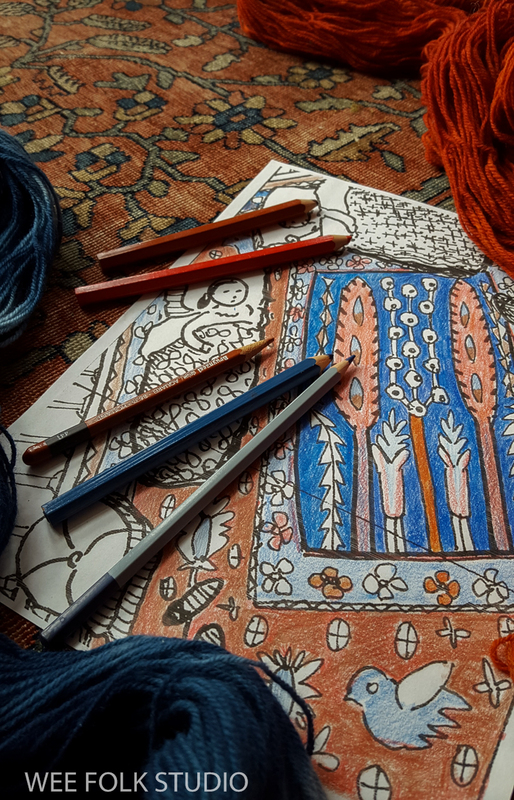 The photo of your glasses resting on the finished rug reminded me of the books about the Borrowers and the delicious interweaving they present of the familiar and the imaginary emphasizing differences in scale. I muse over your literary adventures combining these two worlds–reality and fantasy–and your choices of subject matter. You really range all over the spectrum of playful and joyous, to darkly political, to anthropologically enlightening. Quite the ride, all with a needle and thread. I’m glad you found your artistic voice and have so much to say to young and old. Thanks Mia, that’s quite the scholarly assessment! There are not enough words to say how incredible this is! 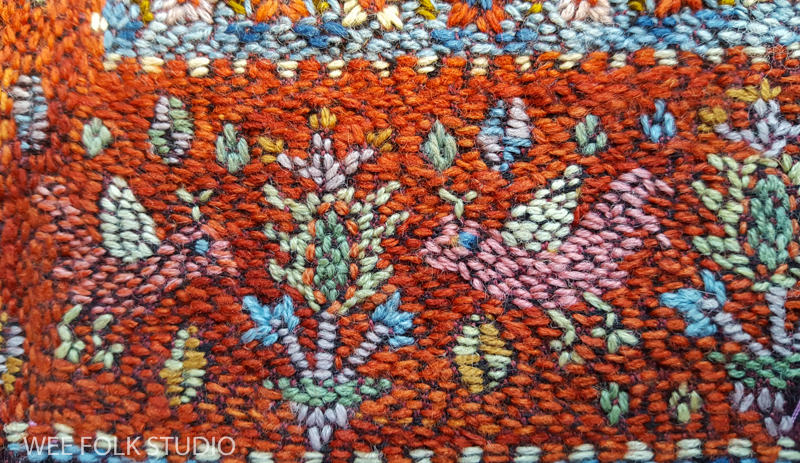 I design and hook rugs, so this little rug of yours really thrills me! I’m so glad I found your blog. I’ve been following it for about a year now. I love seeing what bits and pieces you choose to include in your art. It makes me wonder, though, how you store and organize your supplies. It’s great to have you along, Lisa. Fabric and felt are are mostly organized in plastic bins, in the attic, under the table and stacked up in the bathroom of my studio space. Misc. stuff is in baskets and boxes on shelves. I remember where almost everything is, except for times when I have to turn everything upside down to find a particular item. Photos that show my studio are scattered among various blog posts. I am always inspired by your work and I appreciate you sharing your process. Thank you so much. Can’t wait for the film! it’s absolutely stunning and wonderful! Your work is inspiring, always, but this carpet is something else. It is brilliant. Sally, thanks so much for sharing your eternally creative endeavors! As I went through the post today, I realized that I’ve been in a “2 strands of cotton floss” rut lately in my embroidery projects. I tend to put myself under “rules” sometimes with my creative pursuits. Isn’t that the silliest thing (after all the years I’ve embroidered)?? Lately I’ve been having lightbulb moments of saying, “WHY can’t this just be done another way (with a different thread, fabric, color, etc. )?” I love cotton floss, but I adore wool thread and seem to be happiest cooking up designs including it. 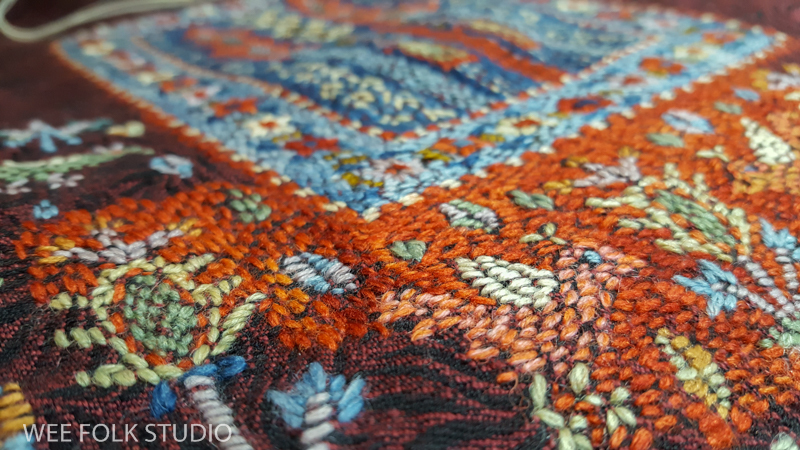 The dyed threads on the background fabric that you’re using look perfect together! 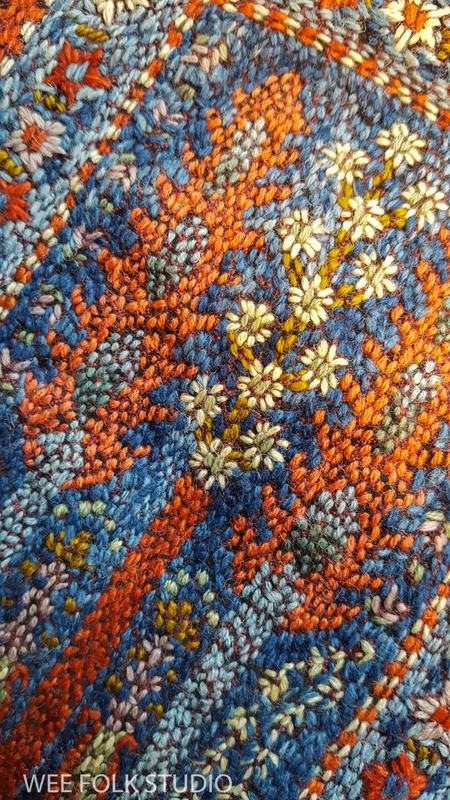 Seeing your fabulous rug, which is such a prime example of how effective a simple seed stitch can be, has inspired me to return to the wool projects I’ve laid aside for a time. I also love that you want to add narrative to your pieces. It’s a beautiful reflection of collaboration and oneness…and that is what integrity is all about (on all levels), isn’t it–that “wholeness.” It’s a beautiful thing!! Thank you for sharing your insightful observations, Cate. Your art and stitch work are lovely. Thank you for sharing . fabulous work, those stitches, beautiful, at some point, I’ll try something like that, inspiring you in your work, of course, but telling my stories, affection from Chile. I love these–wow! My fingers are itching to get a hold of a needle and embroidery thread and start creating. There’s no way I could make anything this exquisite, but you’re work is inspirational.